All Aboard for Train Ride Season! Take a round trip ride along the first commercial mile of railroad track, recognized as the birthplace of American railroading Wednesday-Sunday, April – December and weekends in January. With paid admission train ride tickets are $2.00 for children ages 2-12 and $3.00 for adults and seniors (60+). B&O Members are free! Train ride times are Wednesday – Friday at 11:30 AM, Saturday at 11 AM, 1 PM, & 3 PM, and Sunday at 12:30 PM & 2:30 PM. The Museum reserves the right to change or cancel train rides due to inclement weather or equipment malfunction and are not guaranteed with your visit. Train Ride to Mount Clare Museum House: "Personal Accounts of the Civil War Experience"
With paid admission to the B&O Railroad Museum, you may purchase a train ride ticket and visit Mount Clare Museum House. Learn the story that connects these two great sites. In conjunction with the B&O Railroad Museum, Mount Clare is featuring rare artifacts and stories from the American Civil War. Located near the site of Baltimore's largest Union Army encampment their exhibit and tour highlights a very personal side of War. Tickets for this trip are $5.00 for B&O adult & senior members, $4.00 for B&O children, $8.00 for adults & seniors, and $7.00 for children (2-12). Please note that Mount Clare Museum may not be appropriate for young children and is limited in handicap accessibility and restroom facilities. The Museum reserves the right to change or cancel train rides due to inclement weather or equipment malfunction and are not guaranteed with your visit. The B&O Railroad Museum and the Maryland Historical Society have partnered to offer their members a reciprocal membership program during the month of August. Members must present a valid membership card and photo identification upon entrance into the museum. Please note that members with a Family & Friends membership will be allowed admittance for two adults and two children. 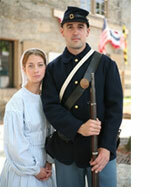 For more information about the Maryland Historical Society, call 410.685.3750 or visit www.mdhs.org. B&O members attend most of these events for free! Visit Membership to become a member today. Children learn the importance of the B&O Railroad during the early days of the Civil War. See pictures of the Thomas Viaduct that was the only link by rail to Washington, D.C. Children will be able to put on the uniform and equipment that a soldier would have used on a day to day basis. They will be able to touch and see personal equipment, leather gear, haversack, and canteens. Feel the history come alive as they explore pieces of American history. Recommended for ages 8 or older. Come learn about Howard County and Maryland during the Civil War as we mark the 150th Anniversary of the American Civil War at The War Came by Train at the B&O Railroad Museum: Ellicott City Station. This exhibit will focus on local events and personalities and how they were affected by the war. This year we will be looking at what Howard County was like in 1861, volunteering and the Draft during the war, and the formation of the Patapsco Guard. Special events will be planned throughout the exhibit including visits from reenacting groups to teach visitors about soldiers during the war. Learn the effect of the railroad during the American Civil War on small town life. For more information, click here. B&O members attend this event for free! Visit Membership to become a member today. Choo Choo Blue Kids Zone inside the Roundhouse now has a new train station, Choo Choo Blue Depot. This interactive exhibit, "We've Been Workin' on the Railroad" teaches children about the tools used by railroad workers. Children may play dress up as a conductor, laborer, engineer, and porter who would have worked on the railroad. The first and third Wednesday of every month through September is Toddler Time at the B&O in Baltimore! Children listen to a classic railroad story, create a craft, enjoy playtime at Choo Choo Blue Kids Zone, and take a kiddie train ride through the fictional town of Choo Choo Blueville—all included with paid admission. Recommended for ages 2-5. A unique visit to the Ellicott City Station where children can play, learn and explore. This four week interactive program incorporates story time, crafts, games and more into a fun activity session for children ages 2-5. Limited to 10 children; advance registration required. $40 for a four week session that includes admission to Ellicott City Station and activities for one child and one adult. Contact Tiffany Shaw at tiffanys@borail.org or 410.752.2490 x 214. "I've Been Readin' on the Railroad"
A magical experience that takes children on a trip and teaches them new things about people and places! Children who participate in this summer reading program earn a free book and a chance to win an engineer's outfit. Pick up a reading journal today at either the B&O in Baltimore or at Ellicott City Station, browse the children's railroad books and begin your journey!